Many troubleshooting scenarios revolve around memory-related issues associated with a system. Typical memory issues can involve an errant application, a specific process consuming too much memory, or failing hardware such as bad RAM or the memory system on the motherboard. 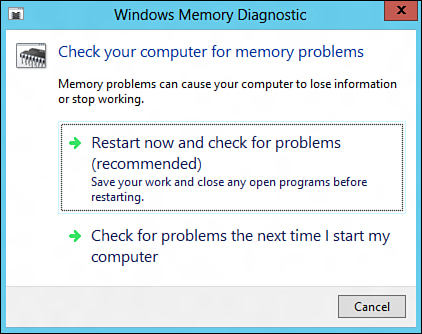 Thankfully, Windows Server 2012 includes a tool for diagnosing problems associated with system memory. By using Windows Memory Diagnostics Tool, an administrator has another way to isolate root issues when a server is performing poorly, subject to crashes, or is exhibiting other abnormal behavior not caused by issues with the OS or installed applications. 1. Save all work and close down open applications and utilities. 2. To invoke the tool, select Start by hovering your mouse at the bottom-left corner of the screen and type Windows Memory Diagnostic into the search box to display and then launch the program. 3. Select whether you want to Restart Now and Check for Problems or Check for Problems the Next Time I Start My Computer, as displayed in Figure 1. Figure 1. The options associated with running the Windows Memory Diagnostics Tool. 4. When the system is rebooted, the Diagnostics tool automatically launches and conducts a Basic test by using default settings. Additional Test Mix options, Cache options, and Pass Count can be selected by pressing F1. The Test Mix options consist of Basic, Standard, and Extended. The Cache option includes Default, On, or Off. In addition, set the pass count value. The value represents the number of times the entire test mix will be repeated. Note a value of 0 represents infinitely. Press F10 to apply the settings and start the memory tests. Status is reported throughout the test indicating results. The Windows Memory Diagnostics Tool might not detect all the problems with the system RAM. Just because no errors are reported doesn’t mean the RAM or even the motherboard is working properly. Typically, the manufacturer of the hardware device will have additional diagnostics utilities that enable an administrator to conduct a deeper analysis of the root problems at the hardware level.